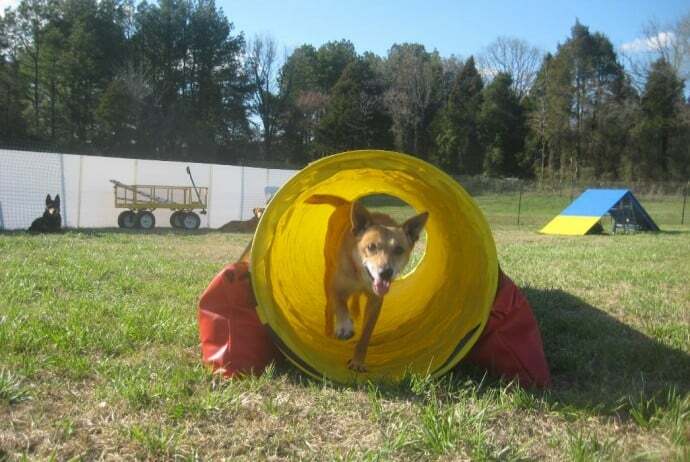 In the photo above, Geronimo and Rocky wait in the background while Piglet practices a tunnel. Being able to calmly, pleasantly, patiently “wait” is a crucial skill for Life in the SMART Zone where health, safety, harmony, and low stress levels prevail. This skill is important not only for your health & stress level but also your dog’s health & stress level. Whether you share your home with 1 dog, or 2 or more dogs, there are numerous situations in your everyday life where a wait is useful. The dog’s position while waiting might be a stand, a sit or a down – a down being useful (comfortable) for longer waiting periods. Afterall, a wait is simply a stand, sit or down plus duration and distraction. The wait can be of brief duration, e.g., wait at a door while it opens, or a longer period of time, e.g., a “relax & settle” type of wait. The title “Waiting Your Turn” refers to a relax & settle type of wait. It refers to situations where you would like your dog to settle for a period of time while you engage in something else. The something else could be a household chore, working at your computer, interacting with someone. For those of you with 2 or more dogs, the something else could be interacting with one of your other dogs. Placing the dog on a mat, rug, dogbed, pillow, blanket or any other type of station is also very useful for teaching this skill. Alumni of SMART DOGS Basic Pet Manners, you probably already recognize this as the “On Your Mat” behavior plus distractions. I encourage teaching our dogs to wait and to relax in various situations throughout our day. Especially those situations which otherwise result in stress and undesired behavior – for both human and canine. I encourage teaching our dogs skills to improve their health and quality of life. Many of the dogs I meet do not yet know how to wait and to relax, and they have high arousal, stress & frustration levels. By teaching them how to wait and to relax, we reduce their arousal, stress & frustration levels, we improve their health and quality of life. And ours as well. Stay tuned. SMART DOGS will be teaching an online workshop on Waiting your Turn. In the meantime, a short video of examples of the Posse using Wait Your Turn (while another dog plays and trains). While there are many occasions where I play, train and spend time with 2 or more Posse dogs, there are also many occasions where I play, train and spend time with only 1 of them, i.e., one-on-one time.